Synopsis: First edition, limited to only 160 numbered copies, each one numbered and signed by author. 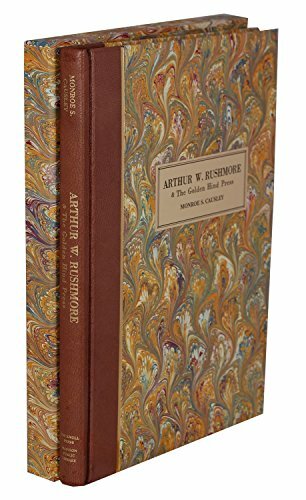 The work is a short biography of Arthur Rushmore and a comprehensive bibliography of his works set by hand for Harper & Brothers and his own Golden Hind Press. This edition was hand set in Monotype and printed on an old Heidelberg press. Tipped in are examples of the unique paste papers produced by the Golden Hind Press along with actual pages from the press' numerous works. This important edition is quarter-leather bound and gold stamped for the discriminating collector. The bibliography covers all known works designed and/or printed by Rushmore from his early days at Harper & Brothers 1927 to his death in 1955 and a few titles printed by his wife shortly thereafter. This special edition on Rushmore and his place in the American fine press tradition will be appreciated by all enthusiasts of this important genre. Printed in Athens, Greece by Kotinos in association with The Madison Public Library in Madison, New Jersey. SALES RIGHTS: Worldwide. 120 pages. quarter leather, slipcase. 8 x 11.5 inches. 1. Arthur W. Rushmore & The Golden Hind Press.